movie summary: Doug Harris (Josh Gad) is a larger than life great guy who has managed to propose to the girl of his dreams, Gretchen (Kaley Cuoco-Sweeting). While planning the wedding Gretchen forces Doug to round-up seven of his best friends to be best men, which is a major problem, because Doug has no friends. While rehearsing his walk down the aisle, Doug becomes aware of a guy he can hire to play his best man. With less than two weeks before the wedding, Doug is forced to hire Jimmy Callahan (Kevin Hart) to be his best man. Jimmy then turns into Bic Mitchem, Doug’s best friend from childhood. Together the pair will have an epic 10 day adventure leading up to Doug’s wedding day and Jimmy’s next pay cheque. my thoughts: This is the part where I am brutally honest with all you. 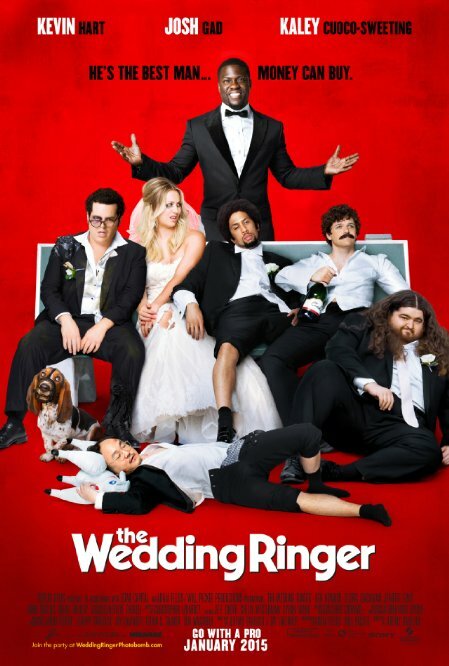 You’ve clicked on my review to hear my thoughts about the Wedding Ringer and I have to say it was not a good movie at all. If you watch the trailer you have seen about 90-95% of the funny scenes and the other ones you’ve missed out are not going to have you on the floor laughing. I laughed, don’t get me wrong, but it all felt forced. There was hardly any spots in the movie where I felt the urge to just laugh and laugh until I cry. The story is extremely predictable leading all the way to the ending, which finally was a perfect ending for once. It thought it was the right ending for a movie that most of you knew was already coming. There are several story developments along the way which lead us to a real honest ending, which is rare in a comedy movie. It was by far my favourite part of this off the wall comedy movie about friendships and relationships with two goofy leads. Kevin Hart is a funny guy, sometimes he plays hilarious characters and then sometimes he swings and misses. In The Wedding Ringer, Hart is the saving grace for Josh Gad’s Doug Harris all the while taking the spotlight off our main character with his multiple personalities. I honestly can’t picture anyone else excelling at the role of The Wedding Ringer better Hart, but then again it wouldn’t take much effort for someone to pull off. His facial expressions, loud/screaming voice, and ability to make up stories on the spot is what made Hart the perfect selection to play this part, a part that would have been tailored made for a guy like Eddie Murphy back in the day. There was a handful of times I thought the situation or part of the story wasn’t funny but Hart would just stick his head into the scene and with his reactions completely change everything. It’s that ability Hart has that keeps him in the headline role and the reason most people check out this movie. On the other hand Josh Gad is a pretty funny guy. He kinda of reminds me of Kevin James, the loveable loser that no matter role he takes on, is funny and willing to take the physical abuse to get people to laugh. Gad makes an excellent sidekick for Bic Mitchem/Jimmy Callahan because they feed off each so well. Doug has lived a very sheltered life with no best friends and has always waited for someone to come along to change all that. Audiences will root for him to pull the wedding miracle off all the while wishing he finally finds the one thing he really desires in life, a best friend. What’s kinda sad about his character is he’s the one guy we all wish we knew and had in our social circle. The one who would always be there in a time of need and never think twice. In return he wouldn’t want money or the glory, he’d be satisfied with the knowledge he was part of the group and that he was needed. I would be friends with Doug Harris, not because he works in the sports industry and lots of money, but because he is a down to earth funny guy that any time out whether it be a baseball game or the comedy club would be an adventure. The world is filled with a lot of nice people and sometimes it’s tough for a good person to stick out when there’s so many negative things going on around them. Doug has everything life could ever offer, a life so many men would be envious of, but he’d trade it all in to be a part of something that he can remember for the rest of his life. The cast of best men is made up of a rag-tag group of guys that no one in their right mind would be friends with, well all at once that is. It would take a long time to break down everyone’s performances but all you need to know is that each one was selected for their roles for a reason. These guys all have special characteristics that spice up the bachelor party, family football game, and wedding rehearsal that will have some people laughing. I would have been more selective with who my best men were and even if time wasn’t on my side I know I could have found some better looking guys. When it is all said and done these guys are professional actors (in real life and in the movie) which will allow them to play their parts perfectly despite the differences in age, appearance, and relationship to Doug Harris. 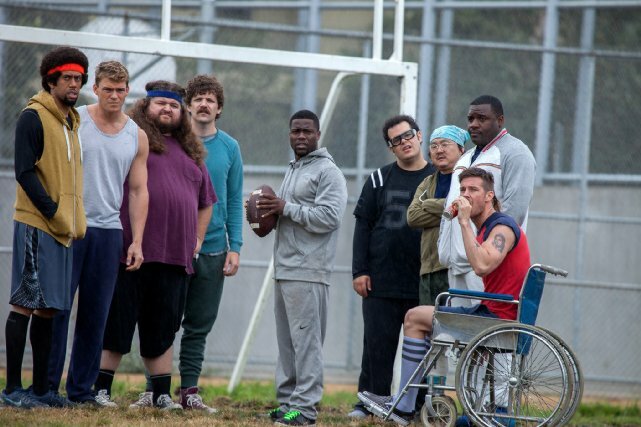 my final thoughts: The Wedding Ringer tries really hard to make you laugh with its unique storyline and crazy characters. Some of you will love this movie and want to see it again, all the while wonder where my sense of humour as gone. I wasn’t a big fan of this movie and out of the three I saw that Tuesday afternoon it by far the worse. It would not be wise for me not to tell you to avoid this movie because most of you have already seen it or plan to see it no matter what I say. My advice is to at least go on cheap Tuesday because if you don’t like it, $7.43 is a lot less than $13.25. Everyone seems to rate this movie about the same, but I love Josh Gad so will give it a shot anyhow. I sadly never heard of Josh Gad until Frozen and only after looking at his IMDb profile for this movie did I realize how many things he’s been a part of. I think he’s really funny and enjoyed his performance as the silly loveable loser, but like I said it wasn’t going to save the movie. Hope you get a few laughs out of it when you finally watch it. Thats what I hate the most about movies, the stupid trailers can either make or break the movie based on high expectations and false advertisements ha ha.